This is rich. Sima Nan, a vocal American critic in China (so, like every liberal American, I guess), got his head pinched between an escalator and wall last Friday. In America. Wait, I italicized the wrong thing. Got his head pinched between an escalator and wall. Global Voices has a translated piece from blogger Yu Xiaoping in which Yu writes, "I deeply sympathize with the injured person, and I don't think this is the time to be ridiculing him." REALLLLY? I can't think of a BETTER time. 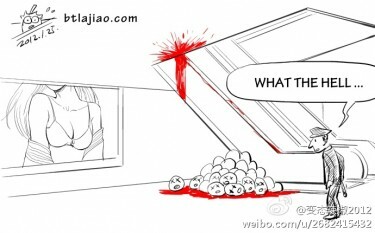 I'm not familiar with Sima Nan's work, but dude -- you got your head stuck on an escalator. The equivalent on the stupidity scale has to be blowing off a digit while mixing dry ice and Coke. Wait, you mean Americans don't like menial labor? I'm not going to quote from this rather bland Forbes article, but the author's point basically is: Americans are too good for those crappy iPhone manufacturing jobs in Shenzhen. I think the most telling thing he says is, "I would rather my children designed iPhones than made them." And meanwhile, factory workers clock in and clock out, eke out a living, do the best they can. I tried forcing myself to watch the CCTV Spring Festival Gala, I really did. But I haven't. Maybe I will next week. Maybe I won't. It depends how drunk I get. Have at it if you'd like. Corollary: "Sleeping Sister" via China Smack.